Augusta National. The Green Jacket. Amen Corner. The manicured fairways. The blooming azaleas. Unmistakeably, the Masters. Golf's first major of the year is upon us, with the world's finest players making their annual pilgrimage to one of sport's most iconic venues. The first tee shot was hit on Thursday with a field of fewer than 100 men aiming to sink the winning putt come Sunday. World number one Jason Day, Jordan Spieth - bidding to become the first man to retain the title since Tiger Woods in 2002 - and four-time major winner Rory McIlroy head the field in the year's first major. Few people, including the bookmakers, are looking past the world's top three players - Day, Spieth and McIlroy - to set the agenda at Augusta. Day and world number two Spieth won three of last year's four majors, while 26-year-old McIlroy is looking to complete the career Grand Slam. Spieth, 22, has failed to find his best form in recent weeks, missing a cut for only the eighth time since the start of the 2014 season, before narrowly avoiding another early exit two weeks later. The American defended his form after being called "garbage" by an internet 'troll', while McIlroy backed his rival by insisting Spieth's form was "not slumping". US PGA champion Day, 28, has continued his fine start to the season by winning back-to-back tournaments, showing little rustiness from a three-month break at the end of last year after becoming a father for the second time. The Australian suffered an injury scare in his opening pool match at last month's WGC-Dell Match Play, but recovered to win the tournament for the second time in three years. Will McIlroy complete the 'Rory Slam'? McIlroy steps on to Augusta's first tee on Thursday (19:01 BST) aiming to become only the sixth man to claim the clean sweep. The Northern Irishman is seeking a first Masters title following victories at the US Open, the Open Championship and the US PGA. Winning the Green Jacket would propel him into exalted company alongside Jack Nicklaus, Tiger Woods, Gene Sarazen, Gary Player and Ben Hogan. And that is the world number three's main priority. "My game feels good," insisted McIlroy, who took three days off last week following his semi-final defeat in defence of his Match Play title. "It's all about going out there over the next four days and executing the shots the way I need to and being mentally strong. "I probably feel a little bit more subdued going in this time because I haven't had the win this year, but I feel like my game is right there." McIlroy missed Augusta's annual Par 3 Contest, which took place on Wednesday, to concentrate on winning the year's first major. He insists he will win the tournament at some point in his career but admits it will become "increasingly difficult" because of the emergence of the likes of Spieth and Day. "I feel like I'm a good enough player," he said. "I feel like I've got everything I need to become a Masters champion. There's no time like the present to get it done." McIlroy has received support from a man who knows all about winning the Masters - two-time champion Tom Watson, who will be making his final appearance in the tournament. "He's the guy. He's my pick this week," said the 66-year-old former US Ryder Cup captain, who has won nine majors. "He can emasculate a golf course. He hits the ball high and so far." McIlroy might well offer the best hope of providing a first European winner since Jose Maria Olazabal in 1999, but he is just one of 16 British and Irish players aiming to emulate the Spaniard. Former US Open champion Justin Rose, ranked eighth in the world, continues his search for a second major. The 35-year-old came close to adding to his 2013 US Open title last year, finishing joint second at the Masters, fourth in the US PGA and in a tie for sixth at the Open. Last year, Rose's combined score over the four majors was 34 under and the fact he twice posted 14 under and failed to win was described by former US Open champion Webb Simpson as the "craziest stat" of 2015. "To back up a US Open win with a Masters would be just incredible," said Rose, who finished four shots behind Spieth at Augusta last year. "It's a venue that we come back to year on year, you begin to develop that relationship with the course, the venue, the feel, the tournament. "And it's somewhere I feel very, very comfortable. I've had a lot of good rounds here. Last year I was able to put four together in a row. "I haven't really had any fireworks yet this year, to sort of come in here with people having me at the front of their mind. I'm under the radar, but certainly feeling good with my game." Rose's fellow Englishman Danny Willett will make his second Augusta appearance following the birth of his first child. The Yorkshireman has risen from outside the top 100 to the fringe of the top 10 in less than two years. Familiar names such as Lee Westwood - who sneaked into the world's top 50 in mid-December to qualify - Paul Casey, Darren Clarke, Graeme McDowell and Ian Poulter all return to Augusta. It could possibly be a final Masters appearance for Clarke, whose five-year exemption for winning the Open in 2011 runs out this week. "I know my form over the last couple of years hasn't been nearly good enough," admitted Clarke, who will captain Europe's Ryder Cup team later this year. "Which is partly why I'm not feeling particularly emotional about this maybe being my last time at Augusta National. "It is a special place to be but if this is it for me, then so be it." England's Andy Sullivan and Scot Russell Knox, who both broke into the top 50 last year, will step into the locker room for the first time. At the other end of the scale, veterans Sandy Lyle and Ian Woosnam, both 58, will play after accepting their annual invites as past champions. Europe's contingent have not won at Augusta since two-time winner Olazabal's last success 17 years ago, allowing American players to regain dominance of the Masters in recent years. The famed Georgia course has produced eight home winners in the past 12 years, including Spieth, who stormed to his first major title. He set scoring records after 36 and 54 holes, becoming the first player to reach 19 under par and equalling the 72-hole tournament record of 270 set by Woods in 1997. The world number two also recorded 28 birdies, beating the previous best of 25 set by Phil Mickelson, as he became the first player to lead outright after each round since Raymond Floyd in 1976. Spieth said he and caddie Michael Greller would try to use last year's success as "momentum". He added: "We know we're capable of playing this place, we have proven it to ourselves the last two years. "My game actually feels better right now than I think it did last year on Tuesday, so that's good if we can keep it consistent." As well as Spieth, there are several others with strong ambitions of becoming the third consecutive American champion. Two-time Masters champion Bubba Watson, the world number four, is one of the favourites alongside Spieth, McIlroy and Day. The 37-year-old left-hander heads to Augusta having claimed two wins as well as a second-place finish in his eight tournaments this year. Phil Mickelson - a three-time winner and veteran of 12 other top-10 finishes at Augusta - is expected to mount another challenge, while Rickie Fowler, Dustin Johnson and Patrick Reed - who are all ranked inside the world's top 10 - will head down Magnolia Lane hopeful of winning their first major. Away from the Americans, look no further than 2016's form man - 2013 champion Adam Scott. The 35-year-old Australian leads the PGA Tour standings - just ahead of Day - after back-to-back titles last month. Scott claimed the Honda Classic at Palm Beach and then beat Watson by one shot at the WGC Championship at Doral. "It's hard for me to think that anything I achieve will be bigger than [winning in 2013], but that doesn't mean I'm not striving to win other Masters or any other big championship," said Scott. "I don't want it to be the one major that I win. I feel I've got the game to win other majors and I'm looking to win my second major championship this week, and I'm driven towards doing that because I want to win a handful of majors in my career. "I need to get my skates on because it's getting tougher and tougher every year. There are only a few players who have been very dominant over 40 years old, and it's probably going to be harder, too, as the young 20-somethings are better and better." Ernie Els is one of four challengers from South Africa who have all come close at Augusta before, along with Branden Grace, Charl Schwartzel and Louis Oosthuizen. Els twice finished runner-up in the Masters during a five-year run of coming sixth or better between 2000-2004. Grace achieved two top-four finishes last year while Schwartzel and Oosthuizen have previously flourished at Augusta - Schwartzel winning in 2011 and Oosthuizen losing a play-off the following year. "The course is very fast and very firm this year which kind of suits me because I can get the ball out there a bit," said Els, who has recovered from a hip injury. "I just played with Branden. He is driving it unbelievable. He's got a lot of confidence. This is not the most perfect venue for him. He hits it a little bit flat but he's long enough. "The other guys are right there. Louis loves it, Charl loves it. They're all playing well." Is Tiger going to play? No. The 14-time major winner has not played since September following a third back operation. The former world number one, who has won the Masters four times, said he has been hitting balls every day as he continues his comeback, but is "not physically ready" to play tournament golf. "I've decided it's prudent to miss this year's Masters," said the youngest ever winner of the tournament. "I need to be cautious and do what's best for my long-term health and career." Masters chairman Billy Payne, who attended Tuesday's Champions Dinner along with Woods, believes the American will soon be back competing. "I could tell the fire is building back up in his belly and I suspect Tiger's going to be back fairly quickly, and I'm looking forward to it," he said. Seeing the sign pointing towards Amen Corner can strike fear into the minds of even the world's best golfers. Many Masters contenders have seen their dreams of slipping into the Green Jacket fade around the turn, including - most famously - Greg Norman in 1996. Five years ago, McIlroy started the back nine with a seven and two fives - six over for three holes - to end his challenge. Amen Corner, a term coined by legendary sports writer Herbert Warren Wind in 1958, strictly refers to the 11th, 12th and 13th holes, but many also tend to include the notoriously difficult 10th. "If you can get through those in level par you're a happy man," says BBC golf commentator Ken Brown. The Masters features many annual traditions, but few are more endearing than the sight of three golf legends teeing off to signify the start of the tournament. This year, however, Arnold Palmer will not be hitting a ceremonial opening drive. The 86-year-old four-time Masters champion is suffering with soreness in a shoulder that is preventing him from swinging a club. Palmer has said, though, that he will still stand on the first tee to watch Jack Nicklaus and Gary Player - the other two honorary starters - "sweat it out". "I would love to go on doing it forever, but I don't have the physical capability to hit the shot the way I would want to hit it," he added. Although the Masters began in 1934, the victorious golfer did not receive a Green Jacket until Sam Snead triumphed in 1949. However, Augusta members had worn the coloured coats since 1937, encouraged by co-founder Clifford Roberts, so patrons could easily identify "a source of reliable information". Once Snead received his Green Jacket, the coat became a symbol of success - and is now one of the most iconic prizes in sport. Winners are allowed to take the jacket home for a year and are rather generously allowed to wear the single-breasted, lightweight jacket "in public during that time on special occasions". After that, past champions have a custom-tailored coat waiting for them on their return to the Augusta clubhouse. "It felt like my old friend was back on my shoulders," said 2013 champion Scott ahead of last year's tournament. Thursday, 7 April: BBC Radio 5 live sports extra, 21:00-00:30. Friday, 8 April: The Masters Highlights, BBC Two, 18:30-19:30; The Masters Live, BBC Radio 5 live sports extra, 22:00-01:00. Saturday, 9 April: The Masters Highlights, BBC One, 13:00-14:00; The Masters Live, BBC Two, 19:30-00:00 and BBC Radio 5 live, 21:00-01:00. 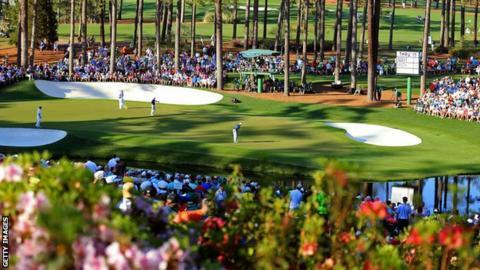 Sunday, 10 April: The Masters Live, BBC Two, 18:30-00:00 and BBC Radio 5 live, 20:30-01:00.